Merck announced that it is voluntarily recalling 1 million doses of two common childhood vaccines, routinely given to children under 5. Here's everything you need to know about the recall. Merck is pulling 11 lots of PedvaxHIB and two lots of COMVAX. 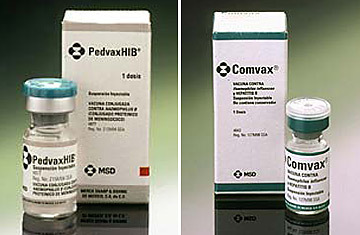 PedvaxHIB is a vaccine that protects against infection with haemophilus influenzae type B (Hib), the bacteria that causes meningitis, pneumonia, and bloodstream infections. The COMVAX vaccine protects against haemophilius B and hepatitis B, a virus that can cause liver disease. Why are the vaccines being recalled? During a routine inspection of their manufacturing process, Merck officials found that some equipment was contaminated with a bacteria called Bacillus cereus. Is haemophilus influenzae the same bug responsible for the flu? No. Haemophilus influenzae is a bacterium, while the microbes that cause the flu are viruses. The Hib vaccine recall does not affect flu vaccines. How can I find out whether my child was vaccinated with one of the recalled shots? Your doctor will know whether he or she received doses from the lots in question. The Centers for Disease Control (CDC) and the Food and Drug Administration (FDA) are contacting all health care providers and asking them to return unused vaccines from these lots. If my child was vaccinated with a vaccine from one of the affected lots, will he get sick? Probably not. Officials at the CDC and FDA stress that there is no serious health risk associated with this recall. The vaccines themselves have not been contaminated so far, but Merck decided to pull all the shots made on those machines as a precaution. What if the vaccines are contaminated  what signs or symptoms should I look for? If your child does get sick from the vaccine, the symptoms of a bacterial infection  redness at the injection site, swelling, fever  will likely appear within the first few days after receiving the shot. "Any problems should appear in the first several days, and by the end of a week if there are no symptoms he should definitely be out of the woods," says Dr. Anne Schuchat, director of CDC's National Center for Immunization and Respiratory Diseases. Will my child have to be re-vaccinated? No. The manufacturing problem does not affect the strength or effectiveness of the vaccine. "It's important to understand that the recall has nothing to do with the potency of the vaccine," says CDC director Dr. Julie Gerberding. "Children who received the vaccine are protected against haemophilus. There is no need to re-immunize." What if my child has not been vaccinated yet? Will there be a shortage of the vaccine because of the recall? Yes. Officials at Merck and Sanofi Pasteur  the companies that produce the 14 million doses of Hib vaccine administered each year  are working with CDC officials to ensure that the shortage is addressed as quickly as possible, but some doctors who received their entire supply of vaccine from Merck may not have vaccines for a few weeks. CDC is making available some doses from its national stockpile, an emergency supply created for just such situations, and Sanofi Pasteur is increasing production to make up for some of the shortfall. If children can't get immunized, is there a danger that we will see more meningitis outbreaks? Probably not. Immunization rates are so high in the U.S.  94% of toddlers are up to date on their Hib vaccinations  that it would take some time for a widespread infection to take hold. "We have a nice cushion because of our high immunization rates," says Schuchat. "That cushion of protection can buy us some time while we are dealing with the supply problem. We are at much lower risk than we would have been before the [childhood] vaccination system was so strong." For more information, go to the Centers for Disease Control website.